Specialists in Servicing, MOTs from £35 and Repairs. Maintain both your vehicle and it’s value by keeping it serviced regularly. Our experienced mechanics are trained to service any make and model of car using the latest techniques and equipment. An MOT is a test to ensure your vehicle meets minimum safety levels required by law. The MOT test is a comprehensive inspection of the interior, exterior and under the bonnet of your vehicle. Whether it’s a re-curring problem with your car, a fault or general maintenance we will happily diagnose the problem, discuss the relevant action that needs to be taken and quote you for the level of work to be carried out. 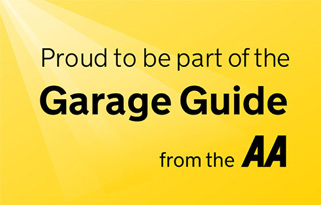 We are incredibly proud to say we’re a part of the AA Garage Guide which endorse just 4000 garages around the UK offering recognised industry accreditations and the highest levels of customer service. The MOT test is a comprehensive inspection of the interior, exterior and under the bonnet of your vehicle. A record is kept of each test whether it is a pass or fail and also a note of all advisory’s for you to keep an eye on. With the summer months fast approaching get the most out of your air conditioning with an air con re-gas. At least 10% of your air conditioning gas is lost from the system each year and manufacturers recommend having them re-filled every 2 years.